As part of a NWR initiate to reduce the number of level crossings throughout the UK, the proposed works involved the installation of a new steel footbridge with concrete ramps and piled foundations to replace an existing level crossing on Gipsy lane in Ipswich. VEDA were employed by J. Murphy as lead design to deliver the Multi-Discipline Design at Detail design stage. This involved the management and delivery of the topographical, buried utilities and signal sighting surveys during line blocks and T3 possessions. Our geotechnical team oversaw the geotechnical investigation that consisted of 2no. 15m deep boreholes either side of the main lines. The GI works was undertaken during a series of isolations mid-week nights and VEDA produced a temporary works Form F002/F003 for the piling platform. The GI proved the depth and type of piles. The installation of the footbridge will require the OLE assets to be lowered, and there was a requirement to remove the telecom assets connected to the level crossing. VEDA engaged their supply chain to provide the OLE and Telecoms GRIP 5 designs and undertook a complete interdisciplinary design check to complete the GRIP 5 design. To facilitate site progress we agreed a progressive assurance process with Network Rail that proposed to fast-track and submit the foundation & drainage design ahead of the bridge structure. 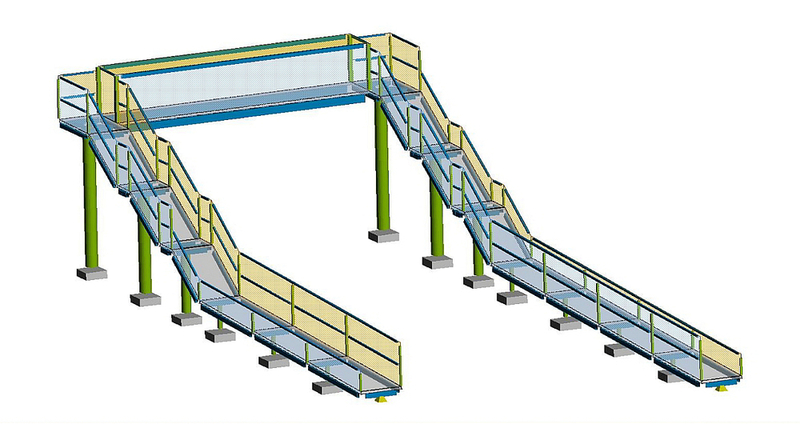 The footbridge design replicated Network Rail standard non-station footbridge modified to allow for the OLE interface. A steel ramp was discounted due to cost, hence VEDA developed a precast concrete ramp solution supported off steel columns. After public consultation in 2014 the ramped footbridge did not proceed to the construction stage and a ramped underpass is to be investigated.